Best all around substrate for most applications. Well suited for bundling, abrasion and operator protection (EN982, ISO NORM 833, EN414). Used on Mobile equipment, industrial machines, covering cable and wiring bundles. Not for Welding. FREE SHIPPING IF YOU PURCHASE THE 150' LENGHTHS!! 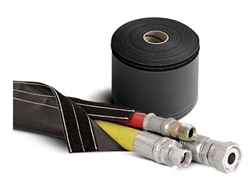 This hose sleeve offers the best of both worlds - great hose protection and flexibility of use. Composed of urethane-coated ballistic nylon, this Velcro sleeve offers great abrasion resistance, chemical resistance and temperature resistance. With the Velcro application, this product is widely used for bundling or binding of wires, hydraulic hoses, tubing and more. It’s a great tool to help protect exposed hoses and tubing from particularly harsh environments. 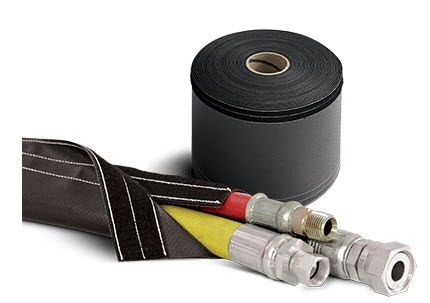 We offer Velcro hose protection in sizes ranging from 1” to 16”. If you buy in full 150’ lengths, the shipping is FREE!! 1. Velcro Sleeve is a reusable sleeve. 2. Many materials to choose from for your specific application. 3. Can be installed or removed from bundling without disconnecting any of the hoses. 4. Saves time, reduces installation and repair time by up to 70%. 5. Proprietary process allows cutting without fraying. Great quality. UV and abrasion protection. Worked perfectly.